WHAT IS YOUR LEGACY GOING TO BE? he Bermuda 100 Challenge launched in March 2017 will document at least 100 shipwreck sites and natural habitats in the waters surrounding Bermuda. UC San Diego researchers from the Center of Interdisciplinary Science for Art, Architecture and Archaeology (CISA3) and Cultural Heritage Engineering and Innovation Initiative (CHEI) will collaborate with Bermuda authorities including the Custodian of Historic Wrecks and make the growing digital archive, including 3D video reconstructions and interactive computer models, available online to the public worldwide. To that end, donors are invited to give directly to the Bermuda 100 Expedition Fund and to provide support for this ambitious campaign to document at least 100 ships, artifacts and culturally significant sites in Bermuda. Providing flexible funding to meet the greatest needs for innovation and discovery through cultural heritage engineering. For more information on giving to the Bermuda 100 project or UC San Diego’s other pioneering efforts in cultural heritage engineering, please contact Adrienne M. Bolli, Director of Development, at 858-822-6968 or abolli@eng.ucsd.edu. Bermuda’s coral reef ecosystem is an invaluable asset to the island, both from an ecological and economic perspective. Coral reefs support an incredible diversity of marine organisms, can be a source of food, and they buffer Bermuda’s coastlines by reducing erosion during winter storms and hurricanes. Reefs also contribute to the local economy by supporting local fishing and tourism, and for many of us, they are a part of our recreational activities and thus important to our quality of life. The corals reefs around Bermuda are considered healthy, but the balanced ecology is vulnerable to even the slightest human influence. The direct and indirect threats to Bermuda’s healthy reef ecosystem are numerous. To safeguard the ecosystem, we have installed environmentally-friendly moorings (buoys) on the reef at a number of popular dive and snorkel sites around Bermuda. Be sure that the anchor, chain and rope do not touch the reef at any point. Never tie your boat directly to the buoy mooring line. Always use a good length of rope from the boat to the buoy mooring line. Allow for extra scope during rough weather. 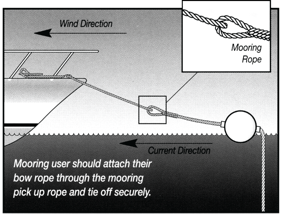 As you tie up to the buoy, inspect the mooring line to make certain the system is secure and lines are intact. Someone should always remain on the boat and that person should know how to operate the boat. When you are in protected areas, maneuver at idle speed only and watch for swimmers and divers. 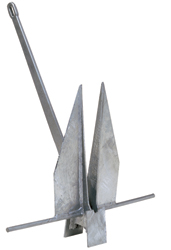 Moorings are suitable for boats under 50 feet long but are not designed to hold larger vessels in rough weather. The majority of the officially deployed moorings are in protected areas (as defined by the Fisheries and Protected Areas Order of 1990), and most of the moorings also identify the immediate surrounding area as a No Fishing zone. The Department of Environment and Natural Resources is responsible for the maintenance of these environmentally- friendly moorings and does so through a marine contractor, in-kind support from commercial dive operators, and financial support from the Bermuda Zoological Society via the Stempel Foundation. The diving and archaeological community is invited to assist with maintaining the mooring lines and buoys to prevent destruction or degradation of coral reefs and wreck sites. Anyone observing damage or questionable boating behavior, or in need of more information, please call (441) 293-2727 ext. 2123. IMPORTANT NOTE: Line fishing, spearfishing and lobster diving are prohibited in these protected areas. Contravening these regulations, upon conviction, could mean a fine and/or imprisonment.